Jaguar has taken its super popular F-PACE, it’s first ever SUV, and has given it a downsize treatment to create the compact E-PACE. 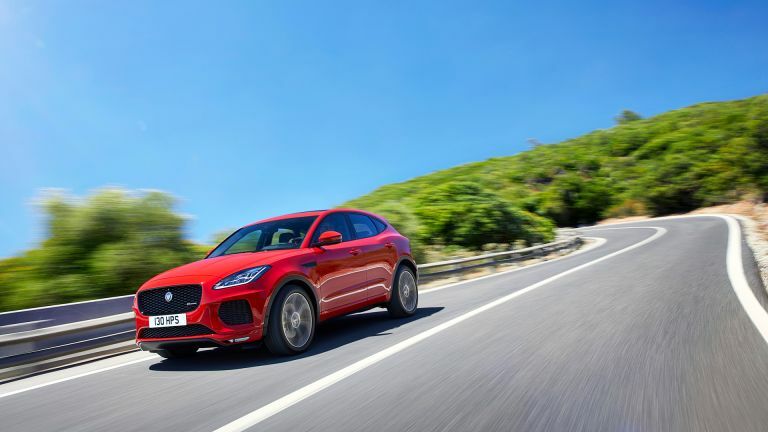 The Jaguar E-PACE combines the sporty looks and driving abilities you’d expect from Jag with the futuristic interior and space you’d be surprised to find in such a compact and sporty car. The result is comfort and good looks with tonnes of power and some seriously good handling. Here are the top reasons this is one very exciting car indeed. Inside the Jaguar E-PACE is enough smart tech to make this a mobile office, cinema and concert hall on wheels. Thanks to speedy 4G LTE Wi-Fi up to eight devices in the car can stay connected. This goes on as long as needed thanks to a whopping four 12-volt charging points and a further five USB ports. The heads-up display is a Thin-Film Transistor setup meaning you get 66 percent more information on the windscreen with full-colour so keeping eyes on the road is easier than ever. The main system is the InControl Touch Pro infotainment setup that offers apps including Spotify right there integrated into the car. This means it can connect to your phone so you can use the apps exactly as you have them setup on your device. And yes, you can access the car from your smartwatch app too. Going for an SUV doesn’t mean you need to sacrifice the passion for driving, not anymore. The E-PACE offers up to 300PS of power in the Ingenium Petrol P300 engine setup that sports 400Nm of torque with all wheel drive power delivery. That means as 0-60mph time of just 5.9 seconds. The super smart and smooth nine-speed gearbox is that found in the Jag XF, meaning sporty performance that just keeps on giving. There’s even an option for paddle shift gears if you want to really take control of the drive. And with all wheel drive on some models it can go off-road capably too, if you need it too. When a car is designed based on the Jaguar F-Type you know it’s going to look good. As a result the E-PACE features that aggressive grille, hunched stance, sweeping roofline and that generally muscular feel. The car comes in three colours of Caldera Red, Yulong White and Santorini Black. Inside the good looks continue with soft grain leather, suedecloth headlining and configurable ambient mood lighting. Then there’s that panoramic roof to let in plenty of light all contributing to a spacious feeling interior. When it comes to smart driving assistance there’s plenty in the E-PACE to help make it nearer to a self-driving car so you can relax on the road more. The car can help you stay in lane, keep your cruising controlled behind other vehicles and even detect oncoming traffic. It’ll even park assist parallel and bay parking. The LED headlight system can adjust beams to avoid dazzling other drivers. A nice new safety feature is just for pedestrians. Should the worst happen and someone step out in front of the car it will lift the bonnet to deploy airbags for the pedestrian. But thanks to a smart emergency braking system the car should stop automatically on detecting a pedestrian (or vehicle) before that needs to be used. Even though you can use a lot of power in the E-PACE, it can be gentle on the wallet when it comes to fuel too. In the case of the 150PS D150 Ingenium diesel engine you can get a whopping 60.1mpg with CO2 emissions of just 124g/km - all pretty impressive for a car of this size, even if it is called compact.